The history of protective eyewear goes back to a man named Powell Johnson. 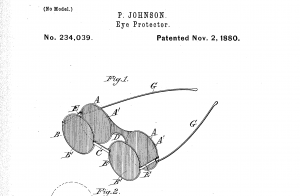 In 1880, Johnson invented the first eye protectors (patent no. 234,039), which improved upon the eye-protection that would be used by firemen, furnace-men, as well as others who are often exposed to intense light, and for those with poor eyesight. However, these glasses did not provide impact protection, as Johnson’s design only consisted of two layers of semi-opaque cloth. 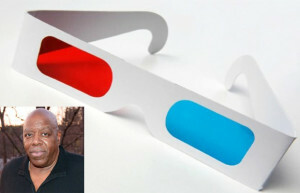 Best known for his invention of the Three Dimensional Viewing glasses, Kenneth J. Dunkley came across this discovery while researching human vision. Considered to be the leading man in the field of holography, Dunkley found he could create a unique visual effect by blocking 2 points in a human’s peripheral vision, which would then transform 2-dimensional visuals into a 3-dimensional space. In 1986, Dunkley filed a patent (patent no. 853,602) for his “Three-Dimensional Viewing Glasses”, or otherwise known as “3-DVG”; this innovation visualized 3d imagery from 2d without the aid of special mirrors, lenses, or any other optical effects. Currently Dunkley is the president of the Holospace Laboratories Inc. in Camp Hill, Pennsylvania, and also receives attention for his efforts as a visual pioneer, as his work was a foundational catalyst in the way we utilize technology to view films today. 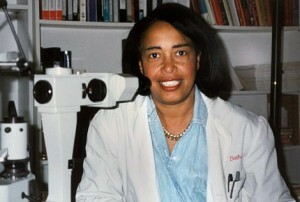 An ophthalmologist from New York, Patricia Bath became the first African-American woman doctor to receive a patent for a medical invention, and is a world-renowned scientist who has dedicated most of her life to the treatment and prevention of blindness in African-Americans. Patent no. 4,744,360 was for the method of removing cataract lenses; Bath’s patent transformed the field of eye surgery by using a laser device called the Laserphaco Probe, in order to make procedures more accurate. Patented in 1988, the probe was designed to utilize the power of a laser to quickly and painlessly vaporize cataracts from patients’ eyes. This replaced the more common method of the time, in which they would use a grinding, drill-like device to remove any afflictions. With this invention, Bath was able to restore sight to individuals who had been sight-less for over 30 years.